Monsoon 2012 – What will happen in Pakistan? What does Monsoon holds for Pakistan? The word “monsoon” is derived from Arabic, Hindi and Urdu words of mawsim (موسم) meaning weather, there is also some indications the word is derived from Dutch word of monsun. The Englishmen used to use this word to define a seasonal prevailing wind in the region blowing from the south-west between May and September and bringing heavy rainfalls to British India. Before the monsoon season, the land and oceans start to heat up with the consequence that the air over the land warms faster and reaches a higher temperature than the air over the ocean. The hot air over the land tends to rise, creating an area of low pressure. This creates a steady wind blowing toward the land, bringing the moist near-surface air over the oceans with it, thus monsoon season begins. A monsoon is traditionally defined as a seasonal reversal of wind direction which is accompanied by changes in precipitation. In Asia, the monsoon season runs from May to September, when Southern Hemisphere winds shift direction and blow north and west across the Equator into Asia, bringing moisture from the oceans they pass over on the way. Before the strong La-Nina pattern, El-Nino (2009 – 2010) was dominating the world that transitional period between El-Nino and La-Nina was on the fastest in recent years in 2010. It was actually because of La-Nina that India and Pakistan saw a good monsoon in 2010 and 2011. It is official now that the La-Nina that re-emerged in November has finally fizzled out after decaying rapidly and conditions are moving towatds a neutral phase. Indian Monsoon 2012 – What could happen? 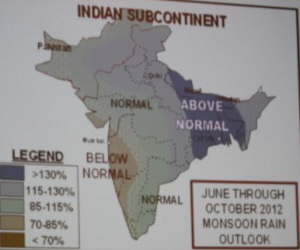 It may mean that monsoon 2012 would be near normal to below normal as a whole over the sub-continent but having said that there are always some isolated places that experiences above normal rainfall and this year it seems as if it would be West Bengal, Jharkhand, Assam, Utter Pradesh, Madya Pradesh and parts of Bangladesh. It is likely that monsoon rainfalls may develop rapidly during the onset of the season but as summer progresses further a decrease in the overall coverage of rainfall could occur. In August and September, are the two months in which decrease in the rainfall activity is expected. The setback for the monsoon season of 2012 is that El-Nino might form during late July that has been observed to cause drought-like conditions across India and Pakistan. While the monsoon also faces another emerging threat that is the Indian Ocean Dipole. Unlike last year when there was a slim chance of +IOD, this year there is a chance of a -IOD that means that the pattern of monsoon would be disturbed. This will decide the fate of the monsoon this year. ← Strongest winds in Tokyo since 1959! But cities like lahore, islamabad, gujranwala doesnt need good moonsoon for very isolated T-Storms which occur quite often in lahore, but they are usually make adverse effect on weather rather than good one, create so much humidity and suffocation. but in terms of numbers they are good, met office usually dont even record them because they are very isolated, typically in 2,3 kms diameter or sometime even in 100 meters or so. That is infact very good..
A little early to talk about a city..
kArachi metr0 …. aNy g00d news ab0ut kArachi mean raiNs in karachi in thIs m0ns0on seAs0n ….? Well, surely it would rain during the monsoon season.. so far its early to forecast about a particular city..
Km Bro i think that this year 2012 monsoons rain will hit more upper sindh then the middle and lower sindh. you can see in monsoons map . so then what you say am i right? Sorry to know that there is none what so ever an official positve forcast available about expected Monsoon rains in Mirpurkhas and Mithi area for 2012 for farmers. So in simple words, forget good rains in Karachi. AGAIN !!! Km Bro i want to know that ( is there any connection between Drought and Tsunami ) ?Drought Means No water on That land and tsunami means Water And Water every where where its hits ) so then i think drought for 2012 has been now denied For Asia because of Tsunami of Indonesia..
Salam Km Bro. And I want to know that WESTERN DISTURBENCE 02 will effect Sindh More ? and then what will be conditions of Larkana City ? in coming Week. salam karAchi metr0, will u teLL me is therE any chances of rains in karachi .. in c0mming week ? because 0f western desturbance 02 .. ? Great. Good one. Can I subscribe something related to weather in Pakistan ? Do you want to share something? nice descituion <<< but can we say that little monsoon can be good for storm active an arbian sea ??????? KM Bro, I want to ask that what will be the conditions of monsoon rainfall in khyberpukhtunkhwa region? as i understand so for, the monsoon will be quite normal in india and no one said that it will be extremely heavy rainfall in Pakistan but only DG NDMA warned that it will be a heavy monsoon this year? I am very confused about this year monsoon? What forcast of monsoon for changa manga this year? Monsoon has started affecting this area..thunderstorm is developing..
Late last week of July..